﻿ Playa del Carmen Safety Tips for Enjoying Your Mexican VacationIs Mexico Safe? Despite headlines regarding violence in nightclubs, the city still remains a safe destination with friendly locals. In fact, when compared to cities like NYC, Playa del Carmen is considered much safer. Boasting low crime rates nearly across the board, Playa del Carmen is safer than many cities in the US. No place is completely 100% safe and free of crime. And the same goes for Playa del Carmen. But if you exercise a bit of caution and common sense, you’ll come back with only great stories to share. That and maybe a bit of a tan. If you travel at night, avoid traveling alone or simply catch a cab. Pickpocketing isn’t unheard of, so avoid the trouble and play it safe. The day is much safer, so do your exploring and having fun while you can still catch a few rays of sunshine. Exercise a bit of caution and avoid areas that seem a little unsavory or situations that may prove less than safe. Alcohol and rowdy people don’t mix, so if you’re like us, skip out on the nightclubs. Instead, find a great place for dinner and watch the waves. Keep an eye on your things. Leaving your possessions unattended is an easy way of never seeing them again. Just by following these few tips and using a bit of common sense, your trip will be amazing. First things first, there is the beautiful beach that runs along the city limits. The blue waters and powder sand seem like a scene straight from a postcard. And for those that love the ocean and the beach, Playa del Carmen has a few surprises. Just off the coast of the picturesque beaches, some of the Yucatan’s best diving waits for anyone willing to suit up. Below the warm waters, an entire coral ecosystem waits to be explored. 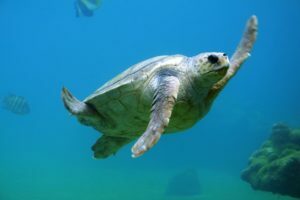 There, sea turtles, eels, and vibrantly colored fish swim, offering amazing opportunities to capture a few photos. Though, if amazing diving spots are not your favorite way to spend your day, Playa del Carmen has more. For those that would rather people watch and soak in the area’s rich culture, stop by Quinta Avenida. The city’s central street is lined with restaurants, bars, and shops. Perfect for unwinding at the end of the day or simply grabbing a bite to eat. Though, if you decide to do a bit of shopping here, remember to bring your best haggling skills with you. 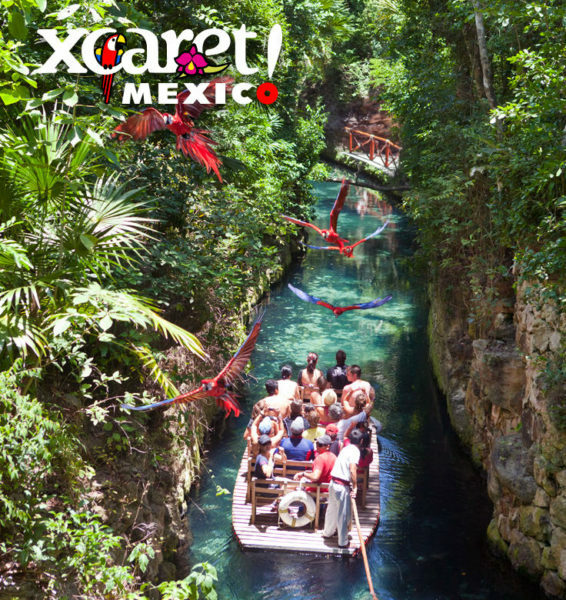 One of the most popular places to visit while in Playa del Carmen is Xcaret. This cultural theme park draws crowds from around the world to experience this unique opportunity to step back into the past. The entire space covers nearly 200 acres and gives visitors a first-hand opportunity to see the area’s culture up close and personal. There you can float along rivers surrounded by jungle and reflect in colonial chapels, all in the same day. Or you can take a step back in time to visit the Mayans, taking in life before the Spanish arrived. With more activities than we can name, you might want to plan for a full day’s adventure exploring the park’s expansive grounds. And hopefully, by now, you’re up to visiting Playa del Carmen to experience it for yourself. Just remember much like anywhere, your visit will be what you make of it. Just be aware while having fun and exercise a bit of common sense. Though, if you would like a few more Playa del Carmen safety tips while staying in Mexico, check out our post on basic safety in Mexico. Or if you’re already there and looking for an awesome place to grab a bite, check out this handy eatery guide for Playa del Carmen! ‘Never walk alone’….. hmmmm what if I’m a girl and I’m about to go to Mexico by myself? How can I not walk alone…. is it safe for a girl to go there? It is certainly safe to go there. The Yucatan is one of the safest places in Mexico. Late at night you might want to catch a cab instead of walking.